ASSAM reported its most shameful incident in recent times on November 24 when a teenaged adivasi girl, stripped naked by some youth during mob violence, ran for dear life on a street in Guwahati with her attackers chasing her in full public view. The girl, a Class X student from Biswanth Chariali in Sonitpur district in northern Assam, pleaded with her attackers for mercy, but in vain. A middle-aged man finally came to her rescue and offered her his own clothes to cover herself. Local newspapers even published pictures of an assailant kicking her private parts, which was subsequently shown by television news channels. - Frontline, December 08-21, 2007. Such an inhuman act can happen only when our society is still inhuman. Struggle for existence and a better life is not new for mankind. Bloodiest battles in the past were fought for the very reason 'to exist and to be able to exist in a better way'. When there is no equality, struggle for existence and a better life becomes obvious and so is the tribal/adivasi movements. Assam Adivasi rebellion is not new, its roots can be traced to Santal Rebellion in 1855. Tribal groups lost their land to money lenders and traders, outsiders encroached their lands, they lost their forest - greatest source of their livelihood during the process of modernization and development, the construction of railways worsened their misery. The railway contractors used brute force to employ them cheaply on construction work and even kidnapped and raped Santal women. The railways even took away the grains produced by Santals and created food shortage. Silent protest of Santals until 1855 did not help at all. They started attacking Zamindars and money lenders, disrupted rail traffic. They even beheaded Mahesh Lal Dutta, a policeman for harassing one of their men. The Santal declared the end of company rule and proclaimed Santal Raj. Santals' guerilla war tactics with bows and arrows were no match to the superior British troops. The British army of over thousand troops equipped with modern firearms and war elephants attacked Santals and it is estimated that atleast 15,000 (fifteen thousand) Santals were killed in the army action. 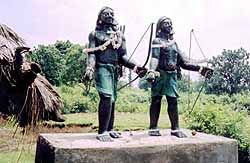 Sidhu and Kanhu Murmu the legendary leaders of the revolt were hanged. The day of rebellion is still celebrated among the Santal community with great respect and spirit for the thousands of the Santal martyrs who sacrificed their lives along with their two celebrated leaders in their glorious albeit unsuccessful attempt to win freedom from the rule of the zamindars and the British operatives[wiki]. More over, after the annexation of Assam from Burma (Myanmar), the British colonial administration started tea plantations on a large scale in the region. Very soon India became one of the largest exporter of tea to the western world. Obviously this created a shortage of labours in the tea gardens. The Tea District Labour Association, constituted under the Tea District Emigrant Labour Act of 1932, started recruiting labour from six labour-surplus provinces – Bengal, Bihar, Orissa, Central Provinces, United Provinces and Madras. The labourers thus brought into Assam had a trying time. The agents, known as free contractors, enticed them with secure employment, good wages and healthy habitation. But what the labourers got was a raw deal. The mortality rate among them became high. The abuse of the free contractors was so grave that it met with protests from various quarters [frontline]. The exploitation, deprivation and treachery continues to exist even today in the tribal regions of our country. If Adivasis in Assam are demanding for better life (the Scheduled Tribe status), there is nothing new in it. The tribal groups are struggling for better life from over 150 (yes! hundred and fifty) years. Their struggle took a new shape with the vote bank politics. Democracy and education enabled tribal groups to realize their rights. And hence the seeds of hope and the better life were sown in the hearts of tribal and adivasi community. "Their recent struggle to gain Scheduled Tribe (ST) status is bound to give new verve to the adivasi struggle for empowerment and may help it to come out of the deadening groove of vote bank politics, the immeadiate need is to address the social and economic issues which continue to plague [EPW]" the tribal and adivasi communities. Some of the News channels like NDTV declared on November 25th that, the recent adivasi revolt was a clear case of age-old enmity between the Assamese and the Adivasis whom the former thinks as "coolies". It would be wrong to see the issues as Assamese-Adivasis confrontation. The problem is more of socio-economic rather than ethnic. Both the government and leaders of tribal/adivasi groups should realize this and should come to the negotiation table and solve the problem.